Assume that there is an average long-term frequency of events per time unit. It doesn’t matter what time unit you use, as long as you always use the same time units. The frequency can be any positive number, including small fractions. A fraction such as 0.2 means that on average, an event occurs once in every five time units. That doesn’t mean that two or more can’t occur in the same time unit. Nor does it mean that a run of ten time units with no events can’t happen. The probability of exactly x occurrences in any time unit is given by the Poisson distribution. The Poisson distribution has one parameter, the average long-term frequency, and it gives the probability for each value of x, starting from 0, 1, 2, without ever ending, and without ever quite reaching a zero probability. 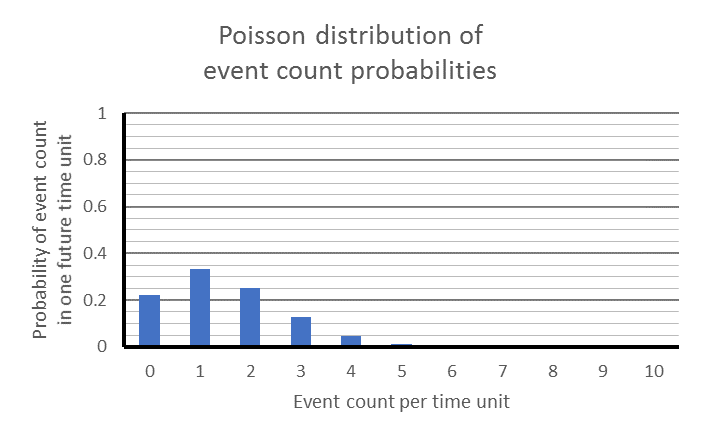 Poisson distribution for average long-term frequency of 1.5, representing a long-term average event frequency of 3 events for every 2 time units. You can get the full explanation of the Poisson distribution from Wikipedia, including an exact formula for each probability. In practice, everyone uses a computer or tables, and computers typically use tables too. Tables are available for both the single value and cumulative Poisson distribution. It is a good idea to use tables manually to check that you are using Excel, or your preferred computer coding, correctly. You will find Poisson tables published free online. The cumulative Poisson distribution is the probability of x or fewer events, given the long term-frequency. It is just the total of all single Poisson probabilities from 0 occurrences through to x occurrences. 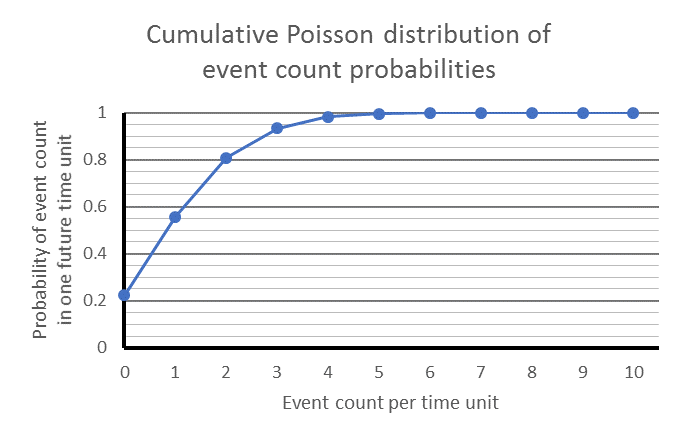 You can get the probability of an event count within a range from x0 to x1 inclusive by subtracting the cumulative Poisson distribution for x0 minus 1 from the cumulative Poisson distribution for x1.